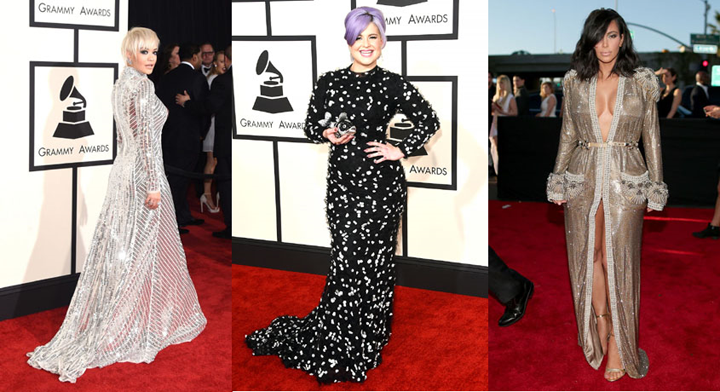 The controversy surrounding this years Grammy dresses is as effervescent as ever. The questions being bandied around Twitter are endless - is Kim too exposed? Does Rihanna look like a marshmallow? Or a work of art? There seems, these days, to be less of a consensus of opinion than ever. Personally, I like Rihanna's dress, if only for the fact that she is brave enough to wear it. The musicians on either side of her, Sia (left) and Joy Villa , however, are definitely within the category of ridiculous. Sia can't see for a start and I don't even need to comment on Joy - at least we know her name now, which I can only assume was her aim. As for the best dressed, in my personal opinion, Rita, Kelly O and Kim came out on top. I have always been a massive fan of Rita's style, she wears bold pieces, but (unlike Rihanna) they are undeniably stylish. Same goes for Kelly O, she clearly has her own style, but this dress is perfect. The long sleeves, high neck and textured finish make for an on trend and super flattering ensemble - topped off with lilac hair, the whole look is so on point. Snaps for Kel! What is your opinion on these dresses?